BUILDOM ™, custom-built modular bathroom pods are revolutionising the way some of the biggest names in Australian construction are scheduling and completing projects. This method of assembly offers a number of on-site and off site benefits to the building process. It is estimated that bathrooms account for approximately 8-10% of the capital cost of a hotel or residential development construction budget, but it is well known that a much higher percentage of site management time, schedule delays and defect problems are rarely accounted for. 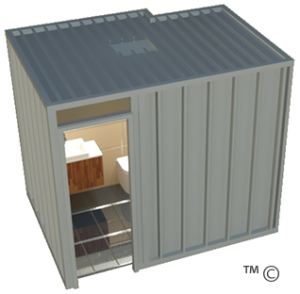 Using BUILDOM® modular bathroom pods can lower costs by reducing construction time, improving quality, and eliminating defects. Some of our well-known customers report that over half of the job defect-list is due to bathroom construction issues, and as a result of BUILDOM® pods months have been shaved off their construction project times. With traditional building, a multitude of trades need to be organised to realise the bathroom design, but with our custom built 6-step process you can remove the high degree of supervision and management of multiple contractors. These include electricians, tilers, floor layers, sealant applicators, decorators, glaziers, carpenters and other specialists… to name a few. Modular bathroom pods eliminate most of these issues, leaving you more time to focus on the bigger picture, and realise earlier income streams from the property because construction times are significantly reduced.